The cost of rooftop solar installations continues to decline but not as quickly as it did in previous years, according to a report from the Lawrence Berkeley National Laboratory. 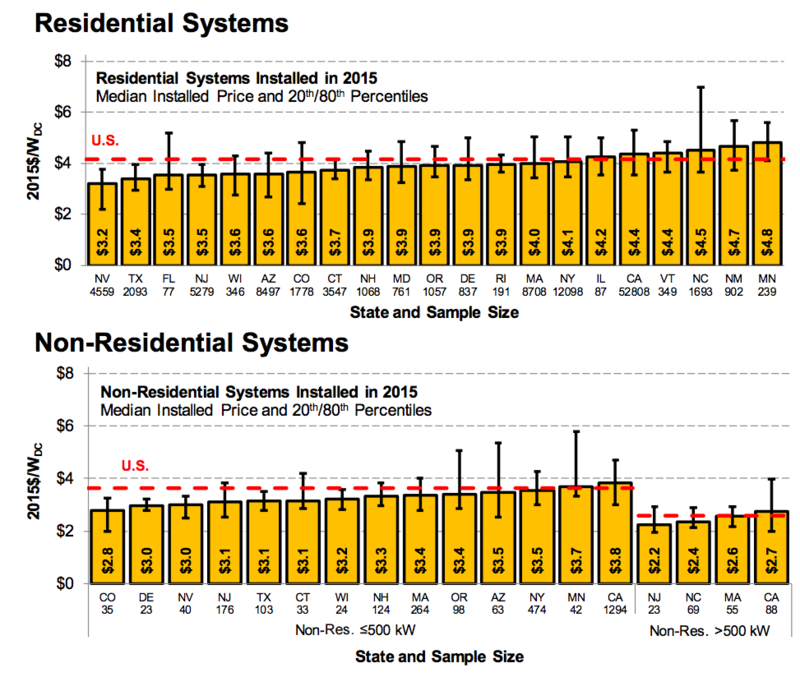 National median installed prices in 2015 declined year-over-year by $0.2 per watt (/W), or 5%, for residential systems, by $0.3/W, or 7% for non-residential systems of less than 500 kW, and by $0.3/W, or 9%, for non-residential systems of more than 500 kW. Solar installation price declines have been partially offset by falling state and utility rebate and tax incentives, according to the LBNL’s Tracking the Sun IX solar market report. 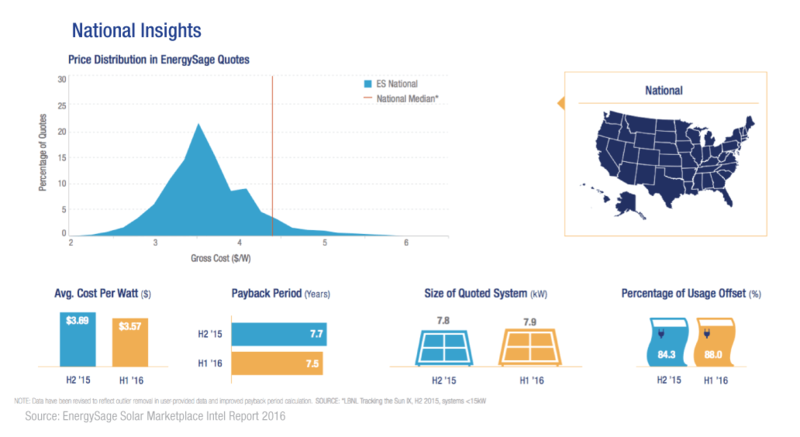 Rebates and performance-based incentives have declined from $3 to $8 per watt of installed solar power at their peak to less than $1/W (or zero) in most major markets. U.S. solar installation prices, the median cost of which is about $4.49 per watt of installed solar capacity, are higher than in most other major national photovoltaic markets, LBNL stated. For example, the starkest difference was with Germany, where typical pricing for residential systems in 2015 was around $1.7/W. While U.S. costs are higher than in other nations, the costs have still dropped, leading to a substantial decline in the amount of time it takes to pay off the average residential rooftop solar system. Since the first half of 2015, the payoff time for the average rooftop solar system has dropped from 8.2 years to 7.5 years in the first half of 2016, according to the EnergySage Solar Marketplace Intel Report, which covers the residential solar industry from the second half of 2015 through the first half of 2016. Founded in 2009, EnergySage is similar to Expedia or Kayak in that it’s a free online service that allows users to input their information and retrieve standardized quotes for a service — in this case, the installation of a rooftop solar system. EnergySage generates revenue from fees paid by solar suppliers and is part of a nascent industry that includes other, smaller players such as Geostellar. According to Vikram Aggarwal, CEO of EnergySage, customers using his marketplace service pay a $3.63 median cost per watt of installed solar capacity compared with the $4.49 median cost cited by the LBLN’s report. Along with decreasing costs, photovoltaic (PV) panels are increasing in efficiency. The average efficiency rating for today’s rooftop solar panels is about 15% to 16%. That means that 15% of the sun’s photons that strike the panels are converted into electricity. “We’re now seeing ratings as high as 19% from some providers. SunPower is touching on 21%. Panasonic also has good performers,” Aggarwal said. Panasonic and other solar panel manufacturers have been in an efficiency battle, going back and forth on which can produce the better performing product. Last year, Panasonic announced a PV module with 22.5% efficiency. With greater efficiency, however, comes higher prices. Solar modules with greater than 18% efficiency had a median installed price that was $0.5-0.6/W higher than systems with mid/low-efficiency modules in 2015, according to the LBNL’s report. 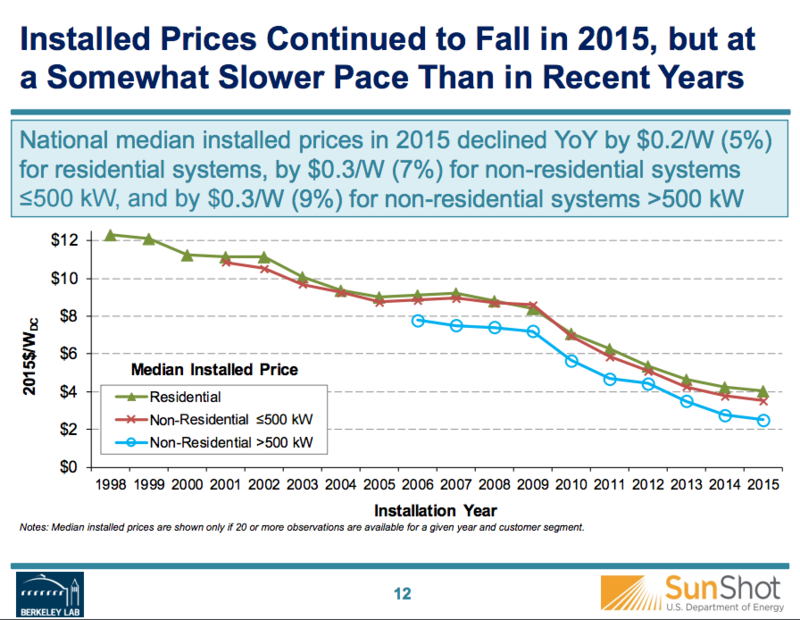 Whichever price consumers received, overall, rooftop solar system installation costs are falling. Systems that used to cost as much as a luxury car five to 10 years ago now cost about the same as an economy car. The gross cost of the average rooftop solar power system before tax credits is $28,203, according to EnergySage. After the federal solar Investment Tax Credit (ITC) of 30% is factored in, the total average cost drops to $19,742. That cost then drops again after state or local incentives are included. As the cost of rooftop solar has plummeted, the share of residential solar energy systems owned by third parties, such as SolarCity, Vivant Solar and Sunrun, has also begun to drop. 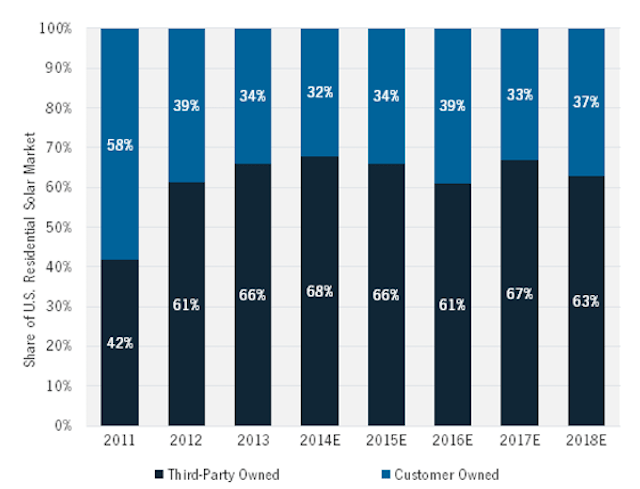 Initially, third party ownership grew from 42% of the market in 2011 to 66% in 2013, but that peaked in 2014 at 68%, according to GTM Research. 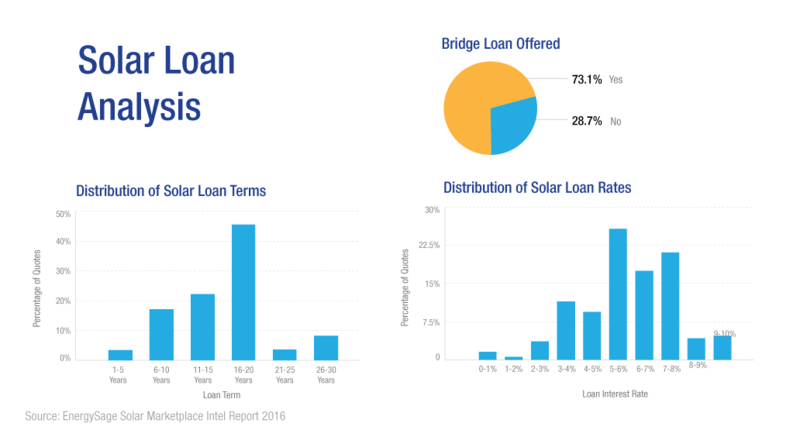 Beginning in 2015, the expansion of residential solar loan programs and alternate financing mechanisms such as property-assessed clean energy programs drove the market toward direct ownership. By 2020, third party ownership of distributed solar power systems will drop to 54%, meaning direct ownership of rooftop solar systems will account for 46% of the forecasted 5.2gW (gigawatt) market, according to GTM Research. EnergySage users are also increasingly choosing to own their solar panels instead of leasing or agreeing to a long-term power purchase agreement (PPA), according to Aggarwal. Dow Powerhouse Solar Shingles installed on a California home. Last year, Dow discontinued the sale of its solar shingles. PPAs are typically 20-year contracts where the solar system provider covers the system costs but receives the federal or state renewable energy incentives and sells the power generated at a fixed rate back to the consumer. SolarCity, for example, charges customers about 13 cents per kilowatt in Massachusetts, while the average utility rate is about 19.5 cents. Additionally, companies such as SolarCity increase what they charge a customer for solar power by a set amount – typically 2.9% per year, Aggarwal said. “A lot of consumers are not comfortable signing up for a 20-year lease,” Aggarwal said. The LBNL report also showed that residential new construction offers significant installed price advantages over systems retrofitted to existing roofs. For example, residential new construction systems in California were $0.5/W less than retrofits in 2015, according to the LBNL’s report. Last year, the average residential rooftop solar system grew to 6.1 kilowatts (kW) of solar generating capacity. Non-residential or business-class rooftop solar also grew in size from last year to this. One technology that promises to change the rooftop solar energy marketplace is solar shingles, Aggarwal said. This month, the nation’s largest residential rooftop solar installer, SolarCity, plans to unveil its first solar shingle product that it will begin selling next year. Five million roofs are replaced each year in the U.S., so swapping out old shingles with ones that generate solar power represents a multibillion-dollar market. “If your roof is nearing end of life, you definitely don’t want to put solar panels on it because you’re going to have to replace the roof,” SolarCity Chairman Elon Musk said during an analyst call in August. “So there’s a huge market segment that’s [been] kind of inaccessible to SolarCity. In 2009, Dow Chemical developed a solar shingle from thin-film cells of copper indium gallium diselenide. At the time, Dow predicted that solar shingles would garner as much as $10 billion in revenue by 2020, while also being cheaper and faster to install than traditional solar panels. However, in June, Dow announced its PowerHouse Solar Shingles were being discontinued.